It is suggested to use a Spherical Primary Telescope Mirror (glass), however when i look into getting larger than 160 mm versions, they start to get extremely expensive. Do you think that the acrylic ones could be good enough to produce some interesting Schlieren images? I am not really looking at lab grade stuff since it's too expensive (if anyone knows a good deal i would be interested), but I would rather have it able to produce "pretty" good images. 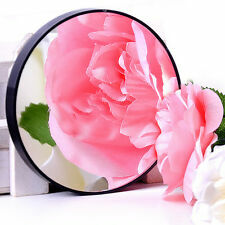 I have one of these acrylic mirrors ...thing to know is they are not ridged , bend like a sheet of plastic , so you will need to secure it to redged hoop around it's circumference.. It will not be as optically perfect as glass ... but the main problem is the focal length is very short in relation to it's size so I don't think it's suitable. These are parabolic but again the focal length is short , but not as short as the acrylic one ...but it's worth a try for just a few $ , very ridged and some come with an adjustable stand ...perfect ! Last edited by oz93666; Jul 20th 2018 at 04:33 AM. As I understand the Schlieren, the idea is to pass a collimated (parallel) beam of light through the region to be imaged. This beam of light is then bought to a sharp focus, before then being projected as an image. At the focus, all the "rays" of this collimated beam pass through a single point. Any rays that are diverted from parallel will miss this focus point. placing a knife edge (traditionally a razor blade) precisely at the focus blocks off all the diverted rays. So only non-diverted rays will appear in the final image. so you need to place a (bright) light source at the focus of your mirror, to create the collimated beam. You then need a sequence of lenses to create the cut off focus point, and then to create the image. I would guess that parabolic verses spherical is not vitally important. Looking more into this I don't think cheap mirrors will work , you may have to buy a telescope mirror . could perhaps an old car or motorbike headlight be pressed into service as a (almost) parallel beam light source?